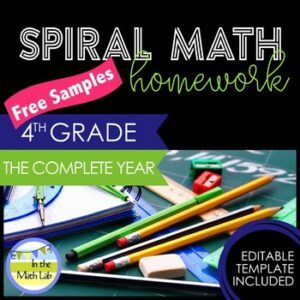 Here are 2 weeks of free pages from my 4th Grade Spiral Math Homework sets — 1 week from Quarter 1 AND 1 week from Quarter 2. (8 pages total). © In the Math Lab. Permission is granted to buyer for single classroom use. No part of this work may be uploaded to the Internet or redistributed in any way.